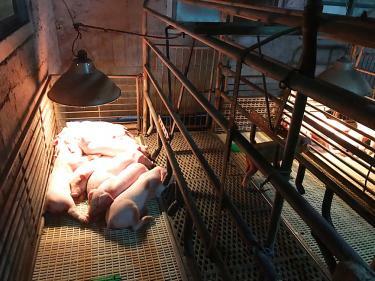 Pigs are seen in a holding pen at a New Taipei City pig farm on March 3 during a visit to the farm by staff from the African Swine Fever New Taipei City Disaster Response Center. Taiwan has not yet received an invitation to the World Organisation for Animal Health’s (OIE) regional conference on African swine fever that is to take place in Beijing on Monday, but Vietnam is seeking the nation’s help in testing the virus, the Council of Agriculture said yesterday. 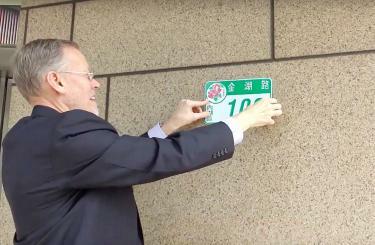 American Institute in Taiwan (AIT) Director Brent Christensen yesterday mounts the address plate at the AIT’s new compound at 100 Jinhu Rd in Taipei’s Neihu District. 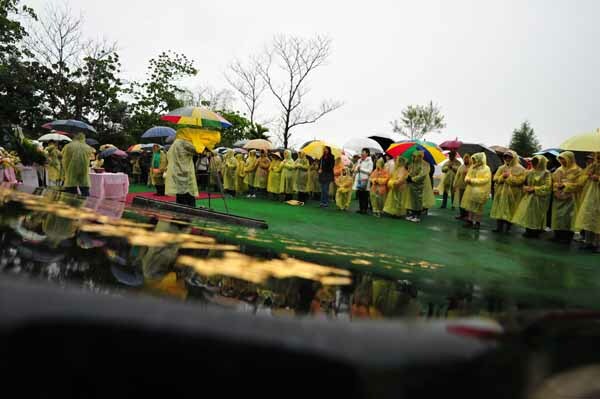 The American Institute in Taiwan (AIT) yesterday said that plans for US Marines to be posted at its new compound in Taipei’s Neihu Distrcit (內湖) are consistent with common practice since 2005 and are part of efforts to ensure the safety of staff. John Bolton, national security advisor, adjusts his glasses while speaking during a White House briefing in Washington, D.C., U.S., on Wednesday, Oct. 3, 2018. 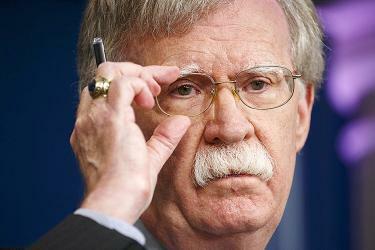 Chinese provocations will not win Taiwanese hearts, but will only bring people around the world that cherish democracy closer, White House National Security Adviser John Bolton said in a tweet yesterday. 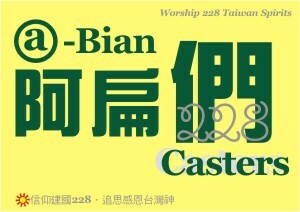 Reactions from several leading Democratic Progressive Party (DPP) members in response to former premier William Lai’s (賴清德) decision to challenge President Tsai Ing-wen’s (蔡英文) re-election bid have been disappointing and raise questions over their dedication to the values that the party’s name suggests. Shortly after Lai on March 18 registered for the DPP’s presidential primary, senior members — including Presidential Office Secretary-General Chen Chu (陳菊), DPP Secretary-General Luo Wen-jia (羅文嘉) and Taoyuan Mayor Cheng Wen-tsan (鄭文燦) — stressed the importance of unity, with Chen declaring her support for Tsai, while DPP Legislator Chen Ming-wen (陳明文) led 34 party lawmakers in signing a letter endorsing the president. It is said that a set of broken bowls and plates are hanging on one of the walls in the home of an eminent older Democratic Progressive Party (DPP) member in Yilan. According to the story, during the dangwai (黨外, “outside the party”) era, many of the leaders of what would later become the DPP met in this house to discuss the movement’s direction. During one discussion, the argument became so heated that the plates and bowls on the table were broken. However, no matter how heated the argument, when the beer came out after the meeting, everyone was happy, and they kissed and made up because they all knew it was nothing personal. 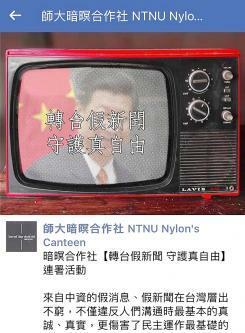 A Facebook post by National Taiwan Normal University’s Nylon’s Canteen student group calls on people to change TV stations to avoid fake news and protect freedom. The US yesterday called for more interaction with China’s military, as the two nations try to build trust over defense issues amid US concerns about Beijing’s rapid military buildup. “More still needs to be done to ensure that our defense and military establishments both have greater ... interaction with one another,” US Assistant Secretary of State Kurt Campbell told reporters.